SunTastic Sunrooms believes that every home deserves a heart, a place where the family can relax, entertain, and live life. Keeping this in mind, the showroom contains all the ideas and options needed to create this ideal space. From three season rooms to all season rooms to screen rooms. All conveniently located at 5740 Osage Beach Parkway in Osage Beach, Missouri. Thank you all for a job well done, we love the room! Thanks for our beautiful sunroom. Our guests have remarked how much they love it. I have never had a company here at the lake do what they promised they would do. Thanks for a great job! Kathy and I are very pleased with the work and service we have received from your company. We would be proud to be a reference should you ever want us to be. I am thankful for God believing people who are a witness and testimony to their faith by the work ethic and personality they portray. May God continue to bless you. I'd just like to tell you how very pleased we are with the quality of service we've recieved from you. From start to finish, Kevin was a complete professional, and the entire process was effortless for us. We are thrilled with our new deck ceiling and we thank you for your excellent service. We love our new screen room! It's so clean looking, just a nice finished look. Mr. Faller came to the shop today to see what's new. He has a Three Season room from us and told me how they love it. Last weekend they had company and put a small camping heater in their room and were comfortable all evening. He said the sun warmed this room enough to use the sunroom all spring and fall as well as summer. Thanks Mr. Faller for a testimony to our great products! 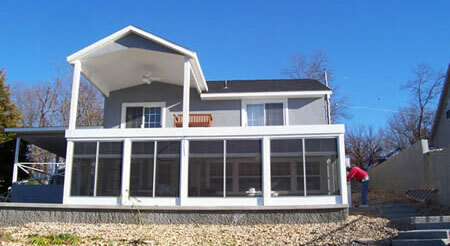 Suntastic Sunrooms is the only local Sunroom Dealer in Osage Beach. We are proud to be active members of the Lake Area Chamber of Commerce, The Lake of the Ozarks West Chamber of Commerce, Lake of the Ozarks Builders Association.